The veteran designation gives veterans an easy and optional way to prove their veteran status to receive discounts from businesses. Eligible veterans may get the designation by visiting any Secretary of State office or when renewing through the mail. 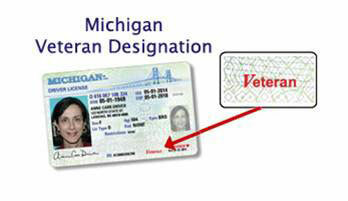 The designation is available when you apply for an original or renewal Michigan license or ID at no additional charge. If added at another time, correction fees will apply. Plus, it allows the Secretary of State's Office to partner with the Michigan Veteran Affairs Agency, and veteran service organizations to provide referral information so veterans better know what resources and services are available to them. The word "Veteran" will be printed in red on the front of the card.